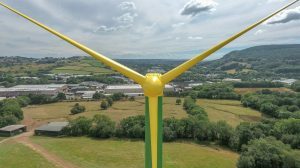 Meet “Delilah” the 214ft high daffodil-inspired wind turbine installed by the Sirius Group for the Royal Mint to provide green energy and an iconic landmark at their Llantrisant coin production facility and new £7million visitor centre in South Wales. Sirius provided a full design and build package to the Royal Mint with Sirius Environmental providing earthworks, civil engineering design and project management. Sirius Remediation undertook the earthworks, foundation, access and electrical installation works supported by APS Ltd – electrical sub-contractors for the Royal Mint. 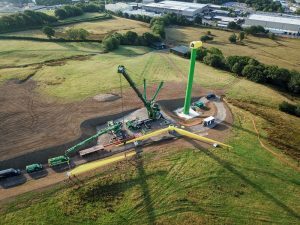 The project was facilitated by our project partners Infinite Renewables who have been working with the Royal Mint on this project for a number of years.